Interest rate of sukanya samriddhi account is revised to 9.2%. Earlier interest rate on this scheme was 9.1%. You can get more information about Sukanya Samariddhi Scheme from here. Interest rate for 5 years Senior Citizen Saving Scheme is revised to 9.3%. Rise of 0.10% is given for this. 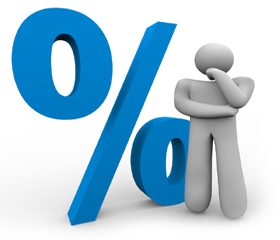 The interest rate of Public Provident Fund (PPF) for financial year 2015-16 remains unchanged. One will get 8.7% interest on PPF. The interest rate of term deposit, recurring deposit, KVP, MIS & NSC also remains unchanged for FY 2015-16. Table given below shows the interest rate applicable for PPF, NSC, KVP and Sukanya Samriddhi account for FY 2015-16. 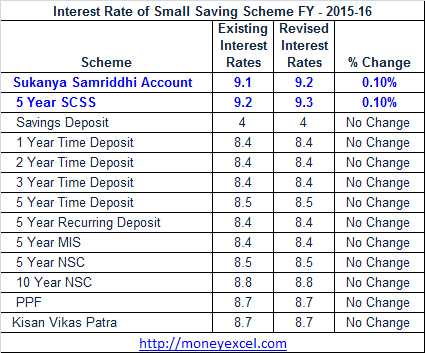 As stated earlier interest rate of Sukanya Samriddhi Account and SCSS is only changed by government. Looking at first instance it is kind of politic gimmick to attract investor for these schemes. No doubt Sukanya Samriddhi Scheme is good scheme & offering very good returns, however interest rate is likely to vary in future. Next government may reduce interest rate applicable on this scheme and investor will have no option because of lock in period. I have developed calculator to calculate exact return for Sukanya Samriddhi account you can download the same from here. You can refer to my reviews about this scheme by clicking on links given below. Kisan Vikas Patra is back should you invest? I hope above information is useful to you.